P3-OM Probiotic Reviews - Is it a Scam or Legit? With just one active ingredient—5 billion colony-forming units (CFU) of patented Lactobacillus plantarum OM per dose—P3-OM Probiotic claims to deliver bigger, stronger muscles. 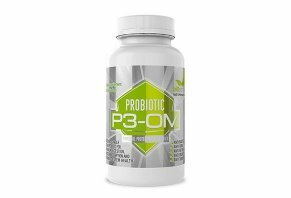 Using a patented process that creates a new ‘super strain’ of bacteria, the P3-OM Probiotic dietary supplement promises to help you build bigger, stronger muscles and make weight loss easier, without a single change to your diet or workout. Specifically, the website advertises this super strain is better able to digest the protein coating of pathogens like yeast, mold, viruses, and parasites, while also increasing the bioavailability of amino acids for improved muscle repair and faster recovery. To experience these benefits, the company recommends that you take 1-2 capsules with a meal during the day, and another 1-2 capsules at night before bed. There’s no doubt that probiotic supplements come with a variety of potential clinically proven benefits. But, compared to other formulas, can you realistically expect P3-OM to deliver meaningfully improved protein absorption—and therefore all of the related benefits promoted by the manufacturer? Let’s help you find some actionable answers by taking a look at the supplement’s underlying concept. What’s the Relationship Between Probiotics & Protein Absorption? In Probiotics 101, we discuss that when taking certain beneficial bacteria strains as dietary supplements, cumulatively referred to as ‘probiotics,’ they’ve been clinically shown to provide a whole host of potential benefits. These include improved digestion, reduced gassiness and bloating, decreased instances of diarrhea and side effects related to irritable bowel disease (IBD), boosted immune response, and reduced constipation, to name just a few. There’s even some clinical evidence that these digestion-related benefits could help specific populations lose weight. Of these beneficial bacteria, Lactobacillus is perhaps the most common species found in dietary supplements. Plantarum, a popular strain within this species, may be especially useful for limiting the presence of harmful bacteria and other diseases that could negatively impact health. What about the patented version of L. plantarum found in P3-OM? As part of the improved digestion it provides, the manufacturer advertises that it will boost protein breakdown, which will consequently improve the flow of amino acids to your muscles—something that’s hugely important for your muscles to repair themselves following intense physical activity. While this might make sense from a high-level perspective, let’s zoom in and take a much closer look at this strain in the next section. According to the supplement facts label listed on their website, the only active ingredient found in P3-OM is 2.5 billion colony-forming units (CFU) of patented Lactobacillus plantarum OM per capsule. According to their patent filing, this “biologically pure strain” is said to have “anti-viral, anti-retroviral, anti-bacterial, anti-microbial, anti-tumoral characteristics and uses,” not found with the original. They add that “the invention also relates to a nutritional supplement having proteolytic activity”—in other words, the process whereby enzymes break down proteins into amino acids. The question, then, is: Will this increased protein breakdown deliver the muscle- and- fitness-related benefits cited by P3-OM’s manufacturer? In short, the company doesn’t provide clinical evidence to support these claims. They do, however, list three additional clinical studies in their patent filing: One showing tumor weight reduction and tumor inhibition in mice, and two others related to its efficacy for retroviral activity against the Rauscher virus (again, in mice). On the P3-OM website, they also reference research that this strain increased “the absorption of leucine by 23%, isoleucine by 20%, valine by 7%, glutamine by 116%, ornithine by 100%, tryptophan by 100%, and citrulline by 128%.” However, no clinical citations are provided to support these numbers. Could P3-OM Probiotic Cause Potential Side Effects? Most individuals who take probiotics don’t experience side effects, and for those who do, they’re often not worse than mild, temporary digestive upset, gassiness, and bloating. Typically, these pass after a few days of regular use. On the other hand, if you have an immune disorder, are pregnant, or are the parent of an infant with short bowel syndrome, taking a probiotic could actually be harmful. Either way, it’s always a good idea to talk with your doctor before taking any dietary supplement, P3-OM Probiotic or otherwise. How Much Does P3-OM Probiotic Cost & Where Can You Buy? Important: Regardless of which option you choose, you’ll be automatically enrolled in the company’s autoship program after placing your order. This means you’ll continue receiving 1, 3, or 6 bottles per month and charged accordingly until you contact support to cancel. All P3-OM Probiotic orders come with an unconditional 365-day money back guarantee. You’ll need to reach out to Masszymes Inc. at 800-719-2467 and initiate the process. We also found P3-OM Probiotic for sale on Amazon at the time of our research for $79.95 per bottle. No autoship requirements were listed. Over the years, the HighYa team has collectively investigated more than 50 probiotic dietary supplements (P3-OM included) and written a handful of related articles and buyer’s guides. But, the reality is that there are perhaps thousands of addition formulation with a variety of bacteria strains, colony-forming units, and additional ingredients available from online and in-store retailers. Price-wise, some are less than $15 while others are nearing the $100 mark. How can you choose the best probiotic supplement for your needs? Ingredients & Labeling – First, make sure that all ingredients are explicitly listed, along with colony-forming unit count, and that there aren't a bunch of additional ingredients in each capsule. Ideally, you want just probiotic strains, and perhaps prebiotics, which acts as a food source to help them thrive. Pricing – For the most part, it doesn’t seem like HighYa readers tend to report meaningfully better feedback after paying more for a probiotic dietary supplement. Online Customer Feedback – What other customers report is often what you can expect to experience after handing over your hard-earned money. Pay close attention to similar complaints you encounter. For more, be sure to read A Guide to Buying Quality Probiotics. Does all of this bode well for P3-OM? From a marketing perspective, P3-OM’s claim to boost protein breakdown and deliver its amino acids to muscles is unique among probiotic supplements. And according to their 1999 patent filing, their L. plantarum-OM strain seems to show some promise for breaking down proteins better than conventional L. plantarum strains (as well as for potentially providing anti-viral and anti-tumor protection in mice). However, the company provides no third party, peer-reviewed, double-blind clinical evidence that this can “optimize the protein you’re already consuming,” as advertised on the website. Or, that this optimization will translate into meaningful muscle- or- fitness-related benefits in humans. On top of this, at nearly $70 per bottle, P3-OM is one of the more expensive probiotic supplements we’ve written about to date. The manufacturer seems to stand behind it with a one-year money back guarantee, though, and it came with mostly positive—if not somewhat limited—online customer feedback at the time of our research. Write a Review for P3-OM Probiotic!